Historical records of ancient Rome indicate the strong probability that the Rottweiler is descended from the drover (herding) dogs which were a popular dog in Rome. The Rottweiler is one of the oldest herding breeds. These dogs were strong, tough, dependable and willing workers, who were characterized by extreme intelligence and strong herding instincts, coupled with enormous instinct to guard and protect their premises. The Roman Legions (shown left) would go on long campaigns to conquer and protect the various parts of the far flung Roman Empire. The Roman armies used the Rottweiler to guard and herd the necessary animals which accompanied them on their campaigns, to provide food for their armies. The Rottweilers were also invaluable to guard the camp at night. The Mastiff nature of the Rottweiler was exceptionally suited to the task of guarding both their food supply and their entire camp. The Rottweiler herded livestock from Rome into various countries. Germany repelled the Roman legion around 200 AD, and the canine cattle drovers were left behind in the Roman provinces in Southern Germany. Researchers and historians say the Roman cattle dogs interbred with the local dogs. The bloodlines of the Roman legion dogs now became part of the local dog population. German locals saw the potential of the large mastiff-like drover dogs. Mastiff-like dogs are descended from the extinct Molossus. 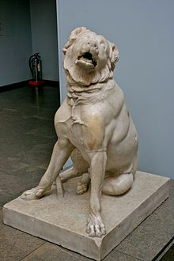 The British museum has an original Greek sculpture of a Molossus guard dog known as the Jennings dog (shown right). The Molossers were used in the arenas, home protection, and guarding the butcher’s meat. Modern breeds that carry the Molosser traits are Bernese Mountain Dog, St. Bernard, Great Pyrenees, Rottweiler, Great Dane, Greater Swiss Mountain Dog, Dogue De Bordeaux, and Newfoundland. Modern Rottweilers today have traits descending from the Switzerland Bernese Mountain Dog (short coat) and the Greater Swiss Mountain Dog (long coat), which appear in their bloodlines. Depending on the Rottweiler's bloodline you can see a difference in coat length and thickness. The other common trait seen today is the occasional white spot on the chest, or the white spot on the foot. This trait dates back before the 1900’s, over 100 years ago. Historic Photographs show the first Rottweiler's were not broad dogs; Their heads were slender with long snouts. The town of Rottweil was founded by the Romans in 73 AD, located in the south west of Germany. This is also how the drover dogs were populated in the town of Rottweil. In 1900 the Rottweil district had become an important cattle herding region. The Roman drover dogs have now proved their worth in protecting cattle from robbers and animals, and also herding the cattle from one range to another; unfortunately, by 1900, the breed declined so much that the Germans only found one breeding female in the town of Rottweil. The Germans did not want their Mastiff-like dogs to become extinct. Sometime in this time frame, the Germans called the new mastiff-like drover dogs “Rottweilers” after the name of the town of Rottweil. 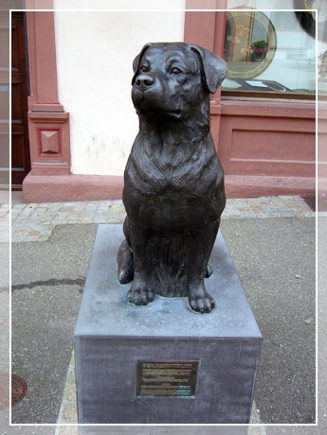 Rottweiler memorial (picture left) in Rottweil Germany. The one female left in Rottweil Germany was bred to similar Mastiff-like dogs to continue the breed. After several years of breeding and having a few foundation stud dogs, Germany started their own club named DRK (“Deutscher Rottweiler-Klub”. The club was created on January 13, 1907. Another club was formed, named the SDRK (“Suddeutscher Rottweiler-Klub”)(Southern German Rottweiler-Club), on April 27, 1907. It then became the IRK (“International Rottweiler Club”). 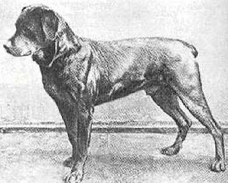 In 1907, the DRK counted about 500 Rottweilers in their club, with their main Rottweiler stud dog named Lord Von Der Tech (photograph below). The DRK wanted to produce working dogs (police, military, Schutzhund), and did not worry about the morphology (conformation / shape) of the Rottweiler. The IRK counted about 3000 Rottweilers in their club, with the main Rottweiler stud dog named Ralph Vom Necktar (photograph below). The IRK wanted to produce homogeneous morphology according to the standard. The Clubs amalgamated and established the ADRK (“Allegmeiner Deutscher Rottweiler Klub”); this is now recognized worldwide as the parent club of Germany. Since the ADRK is the “owner country”, they have the sole right to set, maintain, and revise the Rottweiler standard. In 1911, the FCI (“Federation Cynologique Internationale”) became the world canine organization. It was founded by Germany, France, Belgium, Netherlands, and Austria, to promote the breeding of pure bred dogs. The FCI recognizes 335 breeds. Each breed is owned by its own parent country. Although the FCI is the world canine organization, it cannot overwrite the owner country and change the standard. In 1907, the Rottweiler had a docked tail, shown by many old historic photographs. The Rottweiler tail may have been docked several years before the 1900’s, but it is not a documented record. Check out the updated tail docking rules. The ADRK revised the breed standard to have the natural tail, dated May 1, 1997. Many countries followed the change of the ADRK to have the natural tail. Currently, only two countries dock the Rottweiler’s tail; Canada and the United States. The AKC recognized the Rottweiler breed in 1935, and recognized the Rottweiler as a docked breed. When the ADRK changed the breed standard to a natural tail, the AKC did not comply with the ADRK standard, and kept the Rottweiler breed here in America as a docked dog. Von Der Musikstadt believes the Rottweiler should have the natural tail. This Rottweiler's bloodline dates back in 1906 also, and has 5 more generations of pedigree. IRK foundation male. The DRK goals were to produce working dogs and did not worry about morphology according to the standard. This foundation Rottweiler had a slender long snout, wider top skull, long body, and long legs. Lord owes the race the rapid recovery with the squat catches and the Broad skull. Lord is a son of Remo of schifferstadt, whose size of 72 cm for a time was much disputed. No documented record before these two Rottweilers. IRK foundation male. The IRK goals were to produce homogeneous morphology according to their standard. The Rottweiler had a slender long snout, long body, and long legs. In 1912 this dog was awarded the winning song. In 1911 he was awarded the Hamburg state prize, in 1914 the Royal Saxon State Prize. On international exhibitions he won 16 times 1. Prices, 4 times 2. Prices, once a 3. Price and 20 honorary awards gorgeous, fire and force, much nobility, best hair and badges, good bone, prima Behang and of proper size. The contemporaries said by Ralph that he had been too windy.